If you have an extensive record collection, own a record store or are in charge of a record collection belonging to a museum or library - a vacuum record cleaning system such as one of the VPI Record Cleaning Machines is an excellent investment. Use of these machines guarantees imbedded dirt removal, which equates to less record de-generation and better sound! Bag's Unlimited sells two grades of Record Cleaning machines. The less expensive of the two is a semi-automatic record-cleaning machine (Prod. Code AHW165) which adapts to clean 45rpm records (kit sold separately). The fully automatic version (Prod. Code AHW17F) adapts to clean 45rpm Records as well as 78rpm Records (kits sold separately). See our website for more information on these extremely effective record cleaning machines. Audio records need regular cleaning if they are being played. They should never be played or stored if they are dirty. Bags Unlimited has successfully developed record cleaning solutions for both 78rpm and vinyl records. 2. 33-1/3 LP and 45rpm Vinyl Record Cleaning: Use the same steps for cleaning vinyl records as show above for cleaning 78 records (between the ***), but using our Vinyl Record Cleaning Kit AGCK2 which comes with a 2oz bottle of "Groovy" cleaner (contains alcohol), a micro-bristled cleaning brush and a lint-free chamois drying cloth. 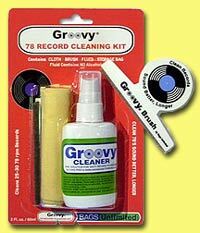 Our "Groovy" refill cleaner for vinyl records: Prod. Codes AGC4, AGC8, & AGC32- contains alcohol, which removes grease and oils from the playing surface. Its formula was also developed for its deep cleaning, anti-static and residue free properties. 3. To clean and lubricate either 78rpm or vinyl records use our record cleaning cloth Prod Code ASA2. It is lint free and contains an anti-static solution as well a special formulated lubricant to keep needle friction from wearing out the record grooves. It also works as a lubricant on 78rpm acetate and shellac record surfaces.